If you’ve never dabbled in influencer marketing, it can be tricky to get started. Especially with the holidays in full swing, influencers are busier than ever. And when it comes to the rules of influencer marketing, they don’t really exist. Bloggers and social media influencers are essentially making them up as they go. This makes it difficult to gauge logistics like pricing and contracts. Fortunately, once you start communicating with various influencers, setting up becomes a lot easier. But even though working with influencers isn’t the easiest marketing strategy, it is indeed one of the most effective. Given the returns it yields, it’s worth diving into (or at least dabbling in) influencer marketing—or as I like to call it, the “Wild West” of marketing. 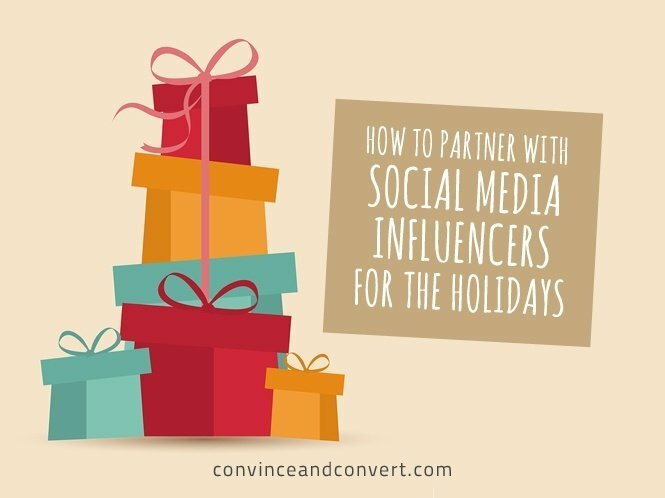 Here are three types of social media influencers, and how you can partner up with them this holiday season. Who isn’t on Instagram these days? The majority of influencers have at least some kind of presence on Instagram because they want to take full advantage of where their readers live. They realize that many readers want the information, but they want it fast and in bite-size chunks. In this case, that’s why photos do most of the talking. Instagram content is visually captivating and allows influencers to get creative with their photo styling. But it’s not just influencers: Everyday people are just as into the platform and are creating user-generated content (UGC) around the products they buy. 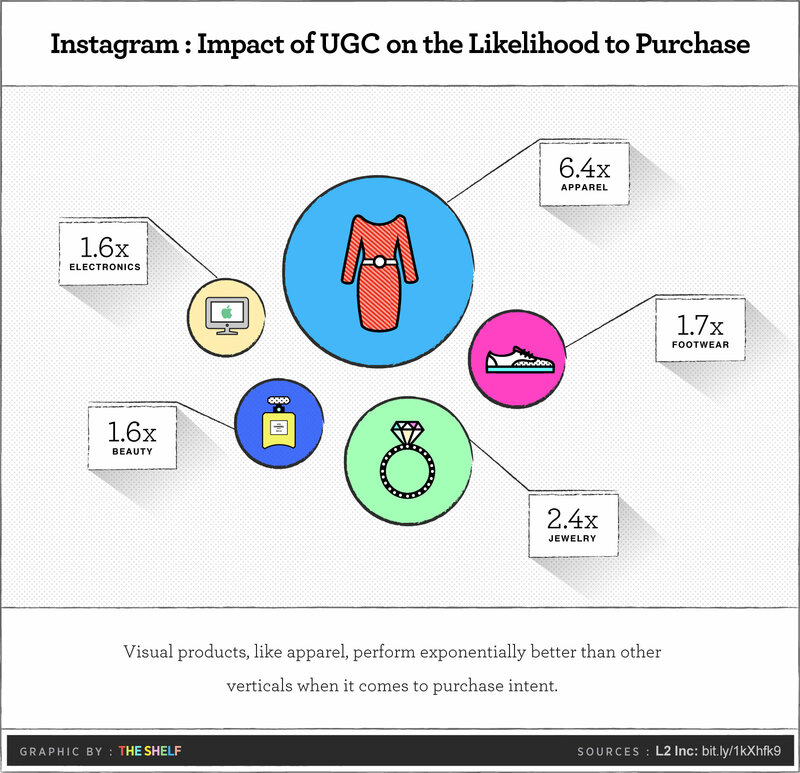 Customers who view or engage with a piece of UGC featuring the brand’s products are more likely to purchase an item. When it comes to UGC on Instagram, apparel has the most impact on purchases at 6.4x, followed by jewelry at 2.4x, footwear at 1.7x, beauty at 1.6x, and consumer electronics at 1.6x. Ask your customers to share their holiday purchases with a branded hashtag you can track. Curate UGC from your customers or influencers on your website or social networks. Develop an ambassador program with Instagram influencers, and get them to share their holiday content. Curate the content on your website and link the posts up to product pages, so that customers can easily shop the products. If you want to bring your products to life this holiday season, video is the way to go. 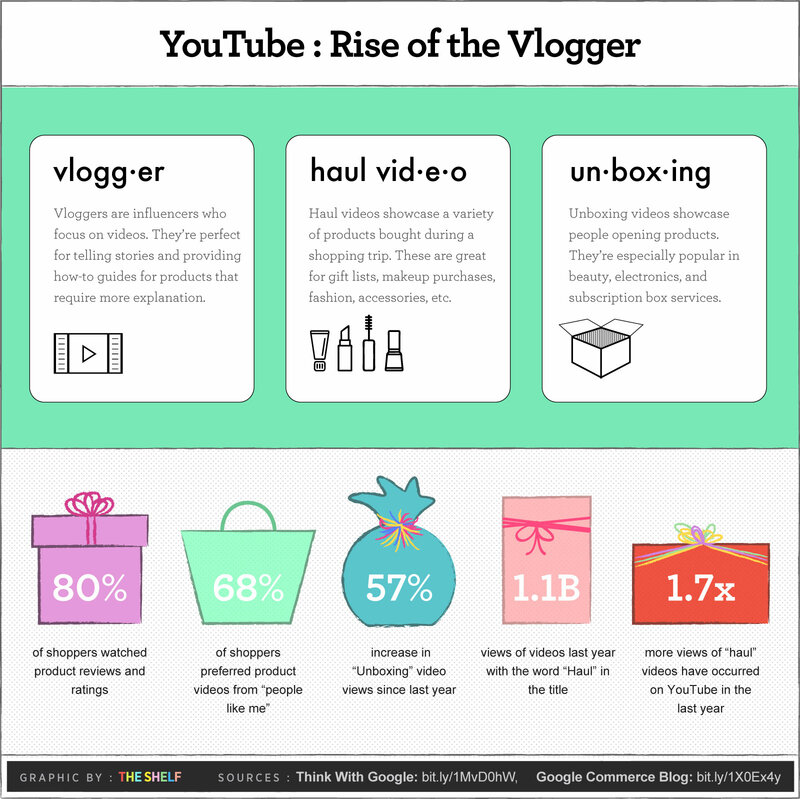 And as luck would have it, vloggers are as influential as it gets when it comes to holiday purchases. From “Unboxing” videos to “Style Hauls” or even just everyday rants, their words are translating into dollars spent. Shopping-related content on YouTube is becoming an important part of the holiday research process. In fact, 80% of shoppers watched product reviews and ratings last holiday season. This isn’t so surprising when you consider that 80% of shoppers engage with a retailer or brand through digital channels before actually walking into a store and making a purchase. Partner up with vloggers that have the eyeballs and ears of your target market. Aside from general campaign guidelines, give vloggers the freedom to be authentic in their videos. Their authenticity is what led them to vlogger stardom in the first place. Ask the vloggers to include an element of surprise, such as an “Unboxing” type video, where new products are revealed and gift ideas are presented in a fun way for their viewers. We all tend to lean toward Instagram or YouTube when it comes to sharing visual content. But here’s the thing that many marketers are missing: When it comes to the breakdown of social media channels influencing holiday purchase decisions, Pinterest is leading the pack at 47.7%. Not only is it easy for shoppers to curate gift ideas onto boards, but their favorite influencers can make it even easier by doing it for them. Great Pinterest content from influencers tends to go viral, which is extremely powerful. It leads to an increase in website traffic and many people often buy the suggested items. The holidays are a great time to curate those gift guides and wish lists, so what are you waiting for? Find the Pinterest influencers in your industry that have serious followings. Their pins will spread faster than holiday cheer. Make it easy for your customers and influencers to share your content straight from your website by integrating the “Pin It” button, or even better, the hover button. Enlist a set of Pinterest influencers to pin products that link up to your website, where customers can shop directly. While I’ve talked a lot about social media influencers, blogging is far from dead. In fact, social media is often just a great supporting channel for followers that don’t have a lot of time to read blog posts. For others, social media is simply the vehicle to discover the fresh blog content in the first place. Check out the holiday marketing infographic below. It’s a gold mine of information on why each social media influencer is rocking the holidays and how you can start working with them pronto.